- WWF Wrestlemania VIII (April 5, '92) = Tatanka defeated Rick Martel. - WWF Summerslam '92 (August 29) = In a dark match, Tatanka won over the Berzerker. - WWF Survivor Series '92 (November 25) = Tatanka took down Rick Martel. - WWF Royal Rumble '93 (January 24) = Tatanka competed in the Royal Rumble, which was won by Yokozuna. - WWF Wrestlemania IX (April 4, '93) = Tatanka won, via countout, over the Intercontinental Champion, Shawn Michaels. - WWF European Rampage (April 25, '93) = Tatanka pinned Papa Shango. - WWF King of the Ring Tournament '93 (June) = Tatanka defeated Giant Gonzales to reach the quarterfinals of the tournament. - WWF King of the Ring '93 (June 13) Tatanka fought to a Draw with Lex Luger in the quarterfinals. Bret Hart won the tournament. - WWF Summerslam '93 (August 30) = Tatanka & the Smoking Gunns defeated Bam-Bam Bigelow & the Headshrinkers. - WWF Royal Rumble '94 (January 22) = Tatanka beat Bam-Bam Bigelow. Later on, Tatanka competed in the Royal Rumble, which was won by Bret Hart & Lex Luger. 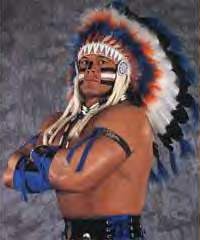 - WWF King of the Ring Tournament '94 (June) = Tatanka took down Crush to reach the quarterfinals of the tournament. - WWF King of the Ring '94 (June 16) = Tatanka fell in the quarterfinals to the eventual winner of the tournament, Owen Hart. - WWF Summerslam '94 (August 29) = Tatanka pinned Lex Luger. - WWF Survivor Series '94 (November 24) = Tatanka, King Kong Bundy, Bam-Bam Bigelow, & the Heavenly Bodies fought in an "Elimination" Match against Lex Luger, Adam Bomb, Mabel, & the Smoking Gunns. Tatanka was eliminated by Luger. Bundy & Bigelow 'survived'. - WWF Royal Rumble '95 (January 22) = Tatanka & Bam-Bam Bigelow lost to Bob Holly & the 1-2-3 Kid in the finals of the WWF Tag-Team Title Tournament. - WWF In Your House 1 (May 14, '95) = In a dark match, Tatanka fell to Bam-Bam Bigelow. - WWF King of the Ring '95 (June 25) = Tatanka & Sycho Sid were beaten by Bam-Bam Bigelow & Diesel. - WWF Royal Rumble '96 (January 21) = Tatanka competed in the Royal Rumble, which was won by Shawn Michaels. - WWF In Your House 6 (February 18, '96) = In a dark match, Tatanka was pinned by Jake Roberts. - i-Generation Superstars of Wrestling (July 30, '00) = Tatanka lost the Australasian Championship to the One Man Gang. - CZW Uncivilized (February 8, '03) = Tatanka & Heartbreaker fell to the Rebel's Army (Greg Matthews & Rockin' Rebel). - WWE Royal Rumble '06 (January 29) = Tatanka competed in the Royal Rumble, which was won by Rey Mysterio. - WWE No Way Out '06 (February 19) = Tatanka & Matt Hardy won a "Non-Title" Match over the Smackdown Tag Champs, M-N-M.
- WWE vs. ECW (June 7, '06) = Tatanka(WWE) competed in a "20-Man ECW/WWE Team Battle Royal", with ECW getting the win due to the Big Show(ECW) being the sole 'survivor'. - PWG Kurt Russellreunion 2: The Reunioning (January 29, '11) = Tatanka competed in the "Legends Wrestle-Royale" Match, which was won by Roddy Piper.